Having an editor or proofreader review your writing for the first time can be a nerve-wracking experience. When you’ve worked on your manuscript for weeks, months or even years, it can be painful to see corrections and comments highlighting your errors or pointing out room for improvement. Well, I’m with you on that – it is uncomfortable getting flaws in your writing pointed out to you. It’s also uncomfortable receiving a meticulously edited manuscript back from your editor which indicates that you have to do weeks of rewrites, or worse still, go back to the drawing board. 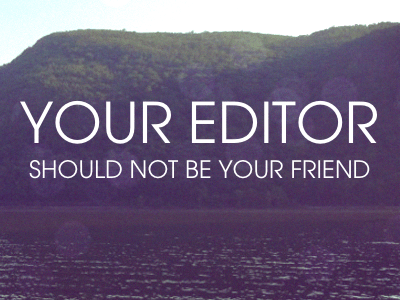 Do not make the mistake of getting a close friend or relative to be the editor you rely on. Your friends are most likely to tell you how wonderful your writing is because they are afraid of hurting your feelings. They may also just not be qualified in telling you what needs improving in the first place. So be warned when a friend tells you that you are the next Stephen King, JK Rowling or even Dostoyevsky. A professional editor will not do that. However, this does not mean an experienced editor takes pride in being rude and hard-nosed, or will in any way attempt to hurt your feelings! They may well be polite and friendly and considerate in their editing style. But being professional means they must put your feelings aside, and take pride only in helping you get the absolute best out of your writing. The editor’s primary job is to identify any possible error, whether in spelling, punctuation or grammar or to indicate areas in the characters, narrative, plot or flow that may benefit from a closer look or a different approach. A good editor takes pride in finding ways to help you improve your writing. But also in pointing out areas which are coming together well. After all, it is important to know what’s already working, even if there is potential room for further development. I work with authors of fiction and non-fiction alike. The author’s job is to know their material and to express it as best they can. And my job as your book editor is not to reassure you that you are the next Stephen King, but to help you work towards becoming the next Stephen King! If you are the next Stephen King, I might tell you. But not because I’m trying to make you feel better. Only if it helps your writing.